Bring the beauty of winter indoors with this cozy craft that makes great use of those paper snowflakes kids love to make. 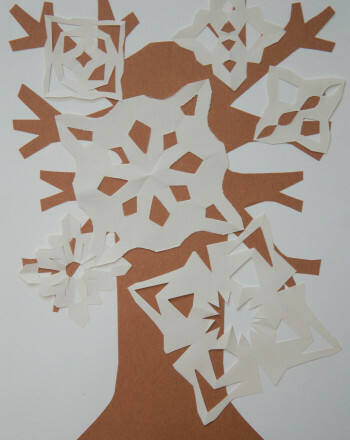 This is a great way to use the beautiful snowflakes your child makes, and explore the concept of negative space while creating geometric prints on paper. The finished product is a one-of-a-kind holiday decoration worthy of any fridge! Have your child make paper snowflakes by first folding a perfect square. To do this, fold the corner of the piece of paper down and line the adjacent sides of the paper up neatly. Crease, and cut off the extra overhang at the end. Fold the paper in half diagonally, into a triangle, and then again into a smaller triangle. Cut out little shapes from the triangle until you're satisfied with the design. Then open the paper up, revealing a traditional paper snowflake. All of this paper cutting is great fine-motor practise for those little hands! 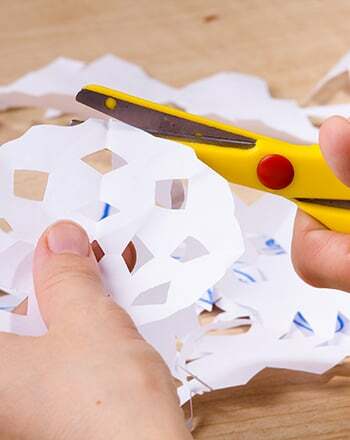 Once your child has cut a few snowflakes, he can select one or two of his favorites and tape onto the sheet of blue paper without having them overlap. Put a small amount of white paint on the paper plate and gently tap with the sponge and then all around the edges of the snowflakes. Before the paint dries, dust the paper with glitter. 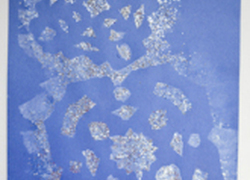 Once the white paint dries, remove the taped snowflakes from the blue paper revealing the unique glittered snowflake print behind. 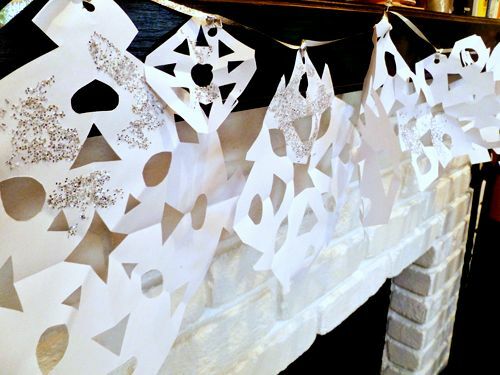 Display the snowflake prints alongside the cut snowflakes for a glittering winter display! She'll get to colour her own card, and even decorate it with glitter.